If you’re looking for the perfect way to show off your gorgeous curls, try a waterfall braided curly prom hairstyle. It’s basically a french braid placed horizontally across the head where the bottom of the three strands is dropped down to create a “waterfall” effect. It’s a beautiful hairstyle that can be dressed up by adding any kind of hair accessory you like! Steal the attention from the prom queen with this amazing avant-garde hairstyle for prom night. Using hair at the crown by swirling loops into what looks to be flower petals, a stunning effect is achieved. Let the rest of your hair cascade down in curls for an equally flowing and exquisite hairstyle that complements the flower wonderfully. As always, Taylor Swift showcases her luxurious curls wonderfully. 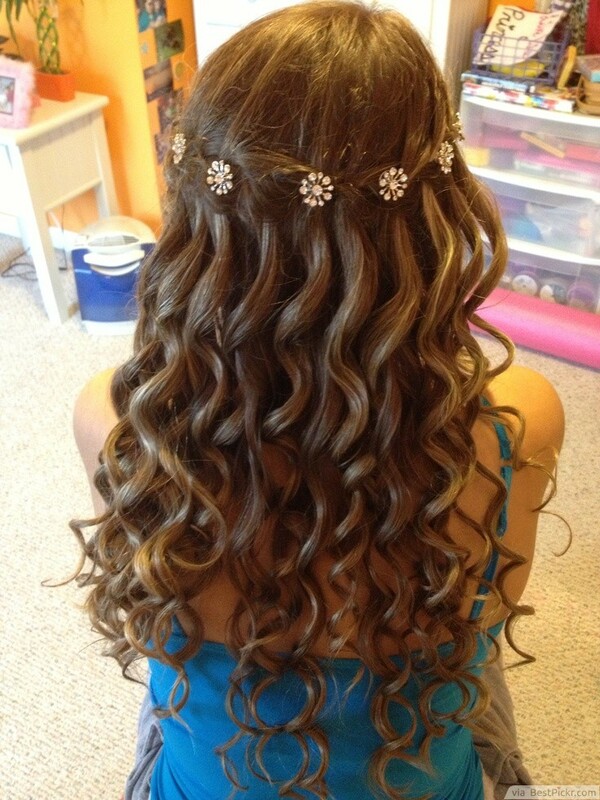 This is a fantastic prom hairstyle for girls with naturally curly hair. Leave a few strands on the right side and pin all the rest of your hair to the left so it can cascade down over your shoulder. Throw on a jeweled headband for added style and know that you look fabulous! Marcel waves are a striking hairstyle for prom because of their timeless beauty. Luckily they’re not too difficult to achieve either! Start by using a conditioning spray on damp hair to tame frizz and allow your waves to stay nice and smooth. For the actual wave, simple clamp a large barrel curling iron horizontally in the first section of hair. Then flip the iron so that the barrel iron the opposite side and clamp it directly under the fist wave. Continue this pattern to create a flow throughout your entire head of hair. A high volume curly ponytail is perfect for balls because it’s not only stylish, but sturdy, so you can dance the night away without worrying how your hair will hold up. To pump up the style factor in this hairstyle, add little twists and braids from the front of the hair leading to the back. That way your hair looks just as interesting from the front as it does from behind! Half-up and Half-down hairstyles are popular because they combine the sophistication of an updo, with a the casual style of let down hair. This is so easy and ideal for women with naturally curly hair, but don't be afraid to enlist the help of a curling iron to get this look for yourself! Pull the top half of your hair towards the back and secure it gently with bobby pins for an elegant prom style. 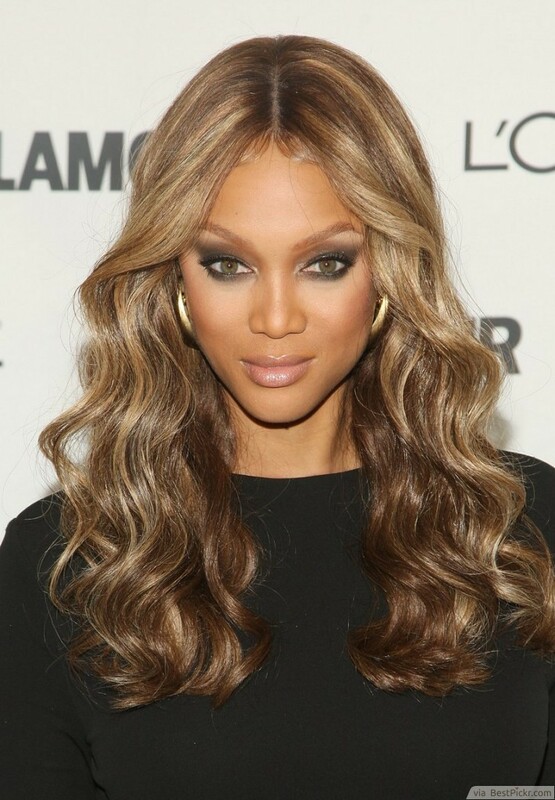 With this simple, center parted hair, Tyra Banks proves that you don't have to overdo it to be a showstopper. Shiny, healthy hair looks divine styled into thick waves. While your hair is damp prior to styling, use a leave in conditioner to boost smooth strands. Use anti-frizz serum to keep the hairstyle looking polished and ward off flyaways. This is a gorgeous hairstyle for prom because the curls add a touch of glamour, but just leaving them down gives your hair a young and free vibe. Let the natural beauty of your hair speak for itself and skip all the teasing, twisting and pinning! Bangs that are swept to the side enhance the whole style with feminine appeal. Carrie Underwood looks stunning with this long curly hairstyle that would be perfect for prom. Let your hair flow with romantic curls. Add a bump by teasing the hair at the crown of your head and smoothing the top layer for a trendy style that will turn heads. Top everything off with a bit of finishing spray to add shine and hold. Shiny, healthy hair is to die for on it's own, but what happens when you pair that with an ultra-fashionable vintage hairstyle? You create the ultimate prom hairstyle. Before you style, use a heat resistant smoothing serum for high shine. Then, smooth the hair over hot rollers for a luxurious curly style!